hello, do people normally stay in 7th hut or the one at the summit? I have no idea how I will be, so I cannot decide which hut to book. Do you know any hut that English available? As you mentioned, staying at Seventh or Eighth station is one of the most popular plans of Mt. Fuji climbing. 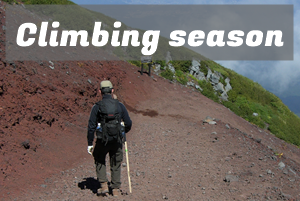 In order to reach the summit of Mt. Fuji in time for the beautiful scenery of the sun-rise (Goraiko), the common schedule is getting a hut on Seventh or Eighth station before sunset, taking a nap, waking-up midnight and setting off again for the summit. However, since many people choose this schedule, the trails to the top of the mountain is always full of climbers before sunrise. So, you may also be able to consider another choice which is staying in a hut on the summit to avoid the jam. But if you have concerns of mountain sickness, it might be better staying on lower stations for getting your body used to low oxygen environment. Mountain huts normally have some English speaking staff during the climbing season, so you can directly make a phone call for reservations.